It seems the decision made by Ruth Fuchs; Tournament Director, to schedule the USTA/ITF SW Desert Classic a week later in February in 2011 really paid off for the players. After 3 years of rain (& snow) wreaking havoc on the finals the tournament was played in ideal weather conditions. 70-75 degrees, sun, and NO wind really gave the players the opportunity to showcase their unquestionable skill and talent. 38 players entered in numerous divisions and the play was simply amazing. Most players were returning competitors and the committee enjoyed the opportunity to catch up and see all the friendly faces. Local favorite, Hayden Snell a senior in high school won the consolation in the Men’s B division and is looking forward to joining the U of A team with Coach Bryan Barten. The Men’s Open was won by Australian Adam Kellerman in 3 close sets against Jon Rydberg and he and his partner, Noah Yablong, teamed up to capture the doubles title as well. 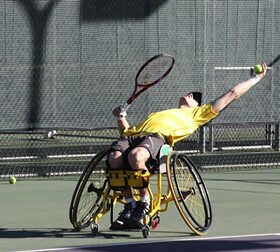 David Wagner, the Australian Open Quad Champion came back to compete in his old hometown and thrilled the fans in the Open division as he made his way to the Semi-finals. As always, the U of A team supported the event and it was a great chance to see the up and coming talent. The players loved staying at the beautiful Hilton El Conquistador Resort and the feeling was mutual. Volunteers from the El Conquistador membership and the junior program were a pivotal part in the success of the event as well as the assistance from the U of A Disability Resource Center. Not only does the U of A DRC play a large part in supporting the event but many are also players. Sue Kroeger; Director of the DRC, competed in 2 divisions and her 1st tournament victory is now in the books. Amanda Kraus is the proud winner of the Women’s A title and Steve Obrien who before, between, and after competing in matches of his own, singlehandedly manned the repair station. Bryan Barten, unable to compete as the Quad division fell short on entries, initiated the entire aspect of player transportation and he and Claudia Dill; player liaison, continue to work as a team before and after the event and have mastered the art of transportation. Linda Helixon; USTA/SAZ Treasurer volunteered her time and the ITF players were so pleased to receive their prize money in cash to help alleviate the hassles foreign players may have when cashing checks. Keeley Hutchinson; USTA SW Community Program Coordinator assisted with the entire event and was on site for the duration as the official photographer. Keeley will be downloading the photos and creating a link for all players to view. Simply a great touch the players are raving about and are looking forward to seeing! As usual, Ruth Fuchs’ attention to detail had the event running smoothly from the first ball hit to the last award presented. The Tournament committee wishes the players continued health and success in 2011 and is looking forward to 2012! !